Twenty one year old James Strode Swearingen was promoted to 2nd Lieutenant in the US Army in 1803. 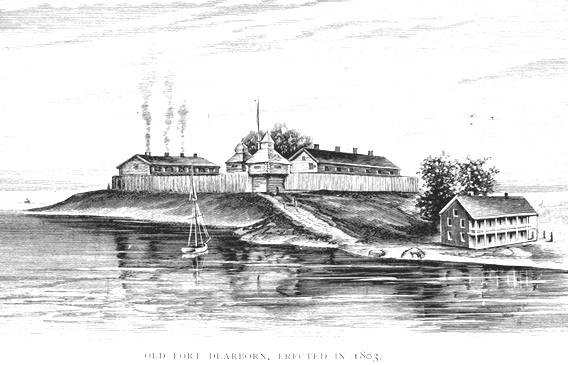 One of his first orders was to march a company of soldiers from Detroit to Chicago to build a fort. His journal of the trip begins on July 14th 1803. It briefly details the company’s daily progress as the follow the old Sauk Trail across Michigan, around the south of the Lake and their arrival at the Chicago River at 2pm on August 17th. He had his soldiers raise the first flag of the United States in Chicago. Since Vermont and Kentucky joined the union, the flag now had 15 stars and 15 strips. On the same day his company began their march, Swearingen’s commanding officer Capt. John Whistler also left Detroit with his family and the rest of his troops, tools and construction supplies to travel to Chicago on the schooner Tracy.